We make sure that new raw materials are created from metal scraps. For almost 70 years, we have been specialising in the proper and environmentally friendly disposal and recycling of scrap metal, non-ferrous metals and end-of-life vehicle bodies, as well as their complete return into the raw materials cycle. 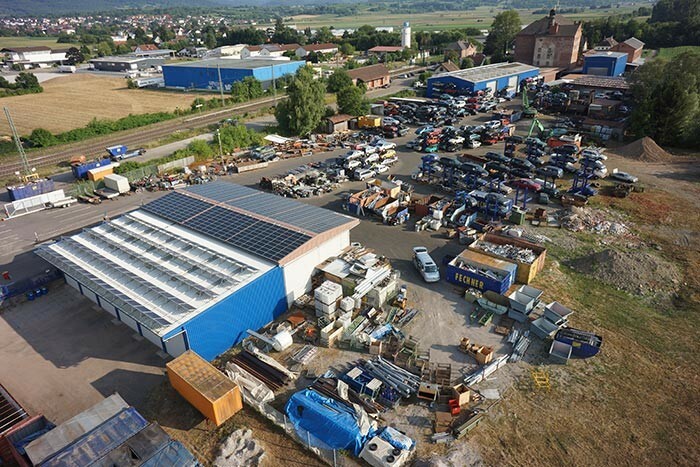 On our business premises, we have comprehensive storage and handling capacities with an electronic 60 tonne weighbridge, several excavators, forklifts and countless special tools. The material you deliver or that we collect is carefully sorted by us, put into interim storage and charged to a charging quantity, so that it can be used again as raw material by steel mills and foundries. Naturally we also offer individuals the opportunity to dispose of their household scraps with us. We are certified as a waste management facility according to § 52KrW-/AbfG. This certification enables us to work to our usual high standards, and gives our clients the security and proof that they have made the right choice with us as disposal partners. As a waste management facility according to § 52KrW-/AbfG, we are every year reviewed by a publicly appointed and sworn expert. The certificate is valid for 2 years and can be found on the Downloads page. We serve our customers every day with various container and crane trucks every day. Our customers appreciate the absolutely uncomplicated and very fast order processing at our warehouse. Our field of work also includes industrial demolitions, dismantling and clearing operations - please contact us.